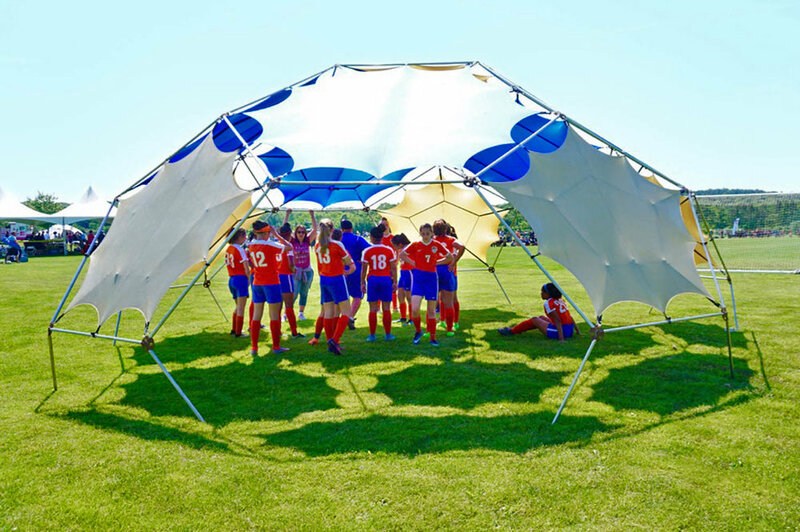 The fact that our dome is soccer ball shaped has never been lost on us, but approaching the megaworld of team sports was always a little daunting, to succeed we needed a rock solid product, and we needed to be able to produce it at scale. This year everything seems to be falling into place. This past weekend we were invited to Huntington NY to the NY Cup 2018 Finals. Our first soccer tournament! Over 90 teams competing for two days. We couldn't have been more excited. Mainly we wanted to see how a tournament would use our system without any other "activation" elements . We got the gig through a good friend of Toby's who put us in touch with Billy Collins. That guy knows soccer! 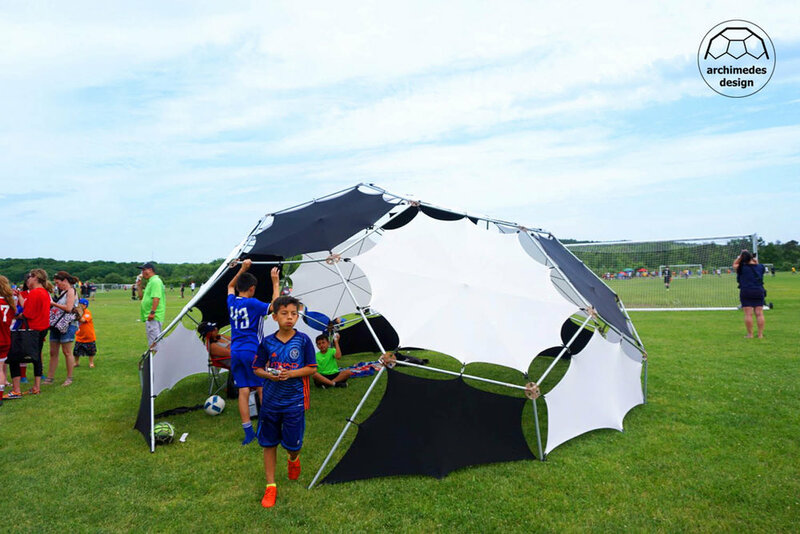 This tournament featured a few clubs including the New York Club Soccer League, Connecticut Club Soccer League and the US Soccer Club. We got a day of research, they got two shade domes. We saw dozens of teams and parents using the domes. We couldn’t have asked for a better first instal and we sincerely thank this tournament for letting us do this! The fields at HBC are wide open spaces, not a ton infrastructure, with lots of family and team. People brought camp chairs, and umbrellas (shade, but I'm sure rain gear would have come out quickly). There were a couple of easy-ups-- we saw a family pick one up and carry it across to another field when game started. We noticed games happened fast, and turnover was often. In a short time one game was done and the field was filling with another team waiting in the wings. For a single team to have one of our domes does not make sense. But to the tournament organizers, leagues or a soccer camps, I think we have a solution. We tested two domes, one large and one small sized. One in a more remote "warm up" area and one near the concession stand. The larger remote dome was occupied multiple times by different teams throughout the day. They used it as a beacon to meet up, drop their gear and bags and do drills with their coach. Then they would line up in two lines and march off to their match. No sooner would they be gone than another team would begin to assemble in the shaded space. We saw it tun over 6 or 7 times. The smaller was placed near the ice-cream trucks. We made the small dome look exactly like a classic soccer ball in white and black shade stars. People loved it! They tended to use it like an ice-cream parlor, having a cone after a game, hanging as much with family as team-- parents and kids. We are super pleased. Although different than we expected, we were happy to see that the domes were adopted quickly. We set out to learn the particulars of the soccer tournaments and camps this year, The Huntington tournament was an excellent experience. Thank you to the NY Cup Finals for being our testing ground, and we can’t wait to see you on soccer fields in the future! The Woods Hole dome of Buckminster Fuller.